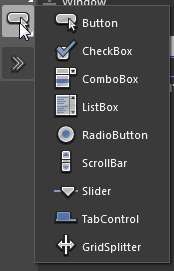 You can add various common controls to your application in Blend using buttons on the tools panel. 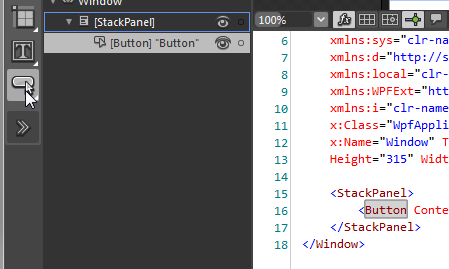 You select the icon for the control that you want to add and then double-click the icon to add it. If you left-click and hold on the Button icon on the tools panel, or right-click, you’ll see a series of controls that you can insert by clicking on the icon at this location in the tools panel. Select the control that you want and then double-click to add to your GUI.